We took a bit of time to run to Pensacola, FL. on Tuesday. 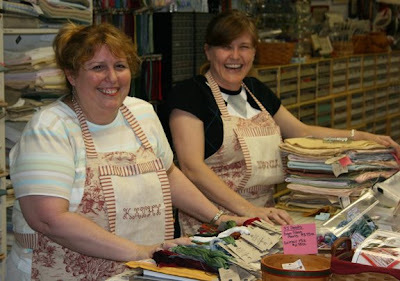 We met Kathy Rees at Nashville Cross stitch market and she told us about her shop. We thought...great time to visit and also get a cross stitch "fix". Her shop is only about 40 miles from Gulf Shores, AL. Not far and a lovely drive along the beach. Kathy and Tonia Wilson were working and we were welcomed into, Needle Delights. with Southern hospitality. Click on the shop name for their web-site link. Kathy has some of her own designs too and you will want to check them out. While shopping at Needle Delights Barb found a Stacy Nash pattern and thought it would make a quick stitch that we could use to celebrate our beach house stay. 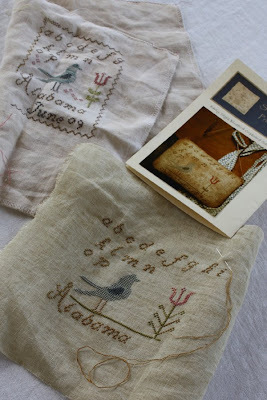 Here are the samplers we stitched. We used linen and thread we had on hand. Barb chose 30 ct. Lucky Penny by R. & R. Reproductions and mine is on 36 ct. Navy Bean by Lakeside linens. Here is a picture of our Stitching Room at the beach. I told Barb...as hot as it was in the afternoon it felt a bit more like a sweat shop! The neighbors wondered what we were up to also. Two mad women sewing like crazy. Here is something sweet for you from us! I found these cups at an antique mall in Milton, FL. The Copper Possum...the booths were clean and well arranged. Looked like the people loved their booths and took really good care of them. Follow the directions for making the brownie dough...I did substitute 1/3 cup butter for the vegetable oil....I'm a real health food nut. Put the dough into a tupperware dish...spoon out a bit for each cup. Save the rest of the dough for 15 minutes later when you will want to make more. It will refrigerate just fine and be great later. Bake at about 335 degrees until the dough looks about done....I didn't want to get the oven too hot because I wasn't sure how the cups would do in the oven. Hey Polly...the wire candle holders are from Curious Sofa. Google the shop on-line. I would look up the link...but would loose my blog info. Not sure how to open another window on Barb's laptop..The shop is in Kansas City, MO. One of my favorite places! I know she would be glad to send you some candleholders. Thanks for the delicious sounding brownie recipe! 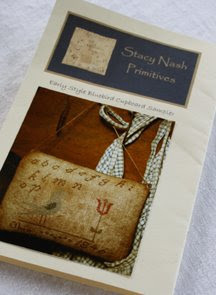 Love your Stacy Nash samplers, and I can't wait to see what you will do with the yo-yos! Pensacola is a great town to visit. I used to live in Panama City. Beautiful beaches. I love to see the pics of your stay in the beach house. What a wonderful way of spending your vacation. I can see where you get your inspirations from! How nice to get to take a liitle break and do some shopping. Your brownies in your new cup just looks heavenly, nutricious and waistline friendly. It keeps the mood up for your sewing in the fantastic sewing porch!! Thanks for sharing, I believe that recipe will go over at my summer retreat too!! Oh I would love a working trip like you are doing! Away from everything and everyone and able to just sew and stitch! I can't even imagine how nice that would be. I am green with envy. Love all your pictures, etc. thanks for sharing - at least I can live vicariously! I really enjoy coming on this blog, love your pictures ! Vero in sunny Paris but without wawes ans sea. Wow I envy you two the beach! Looks like a great location! Makes work alot more fun. What a great idea for the Stacy Nash pattern! Very pretty momento of your trip to Alabama. Of course we have to eliminate that vegetable oil for butter!! Certainly the ice cream is dairy, and the chocolate is a stress breaker! Have fun stitching and quilting! Can't wait to try your recipie! Looks delish... I love your samplers, too. You two have the life. Who else would have thought to take candles and holders on a vacation! Love the brownie and cup idea, too. So anxious to see what else you have come up with on the vacation; the yoyos are such a tease. Sewing at the beach! Fabric, stitching, chocolate, what more could a girl want! Your blog and photos are inspiring and make me happy. Thanks for sharing your vacay with us! You two are simply my kind of gals! I am loving reading what you are up to on your beach vacation and the pictures are wonderful. Keep having so much fun! You bring a big smile to my face! That is the fanciest beach sewing room I have ever seen! 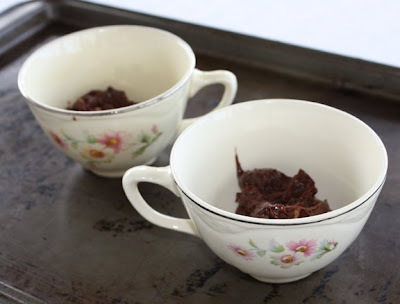 Complete with teacup brownies - yummm! Your SN bags are lovely! You two are amazing and Alma you are a natural born blogger! It is so much fun reading what you choose to share with us. I lived in southern Alabama for seven years and loved going to the beaches there.It was so many years ago. You have brought back wonderful memories for me. It looks like a splendid time! Brownies and sewing....what could be better than that? Thanks for the recipe, I will have to try that soon. BTW I've been to that Needle Delight's store before. It's great! I took my two very small children (4 and 6 months) on an adventure. I had to meet my hubby at Eglin AFB, but I flew into pennsicola, and navigated my way there. I had to go to a stitching store, because the project I brought was almost finished from the plan ride down. I found their address in the phone book and started driving with my little map. No cell phone, no internet, and no TomTom. (What did we ever do without those wonderful devices). Needless to say, I looked forever for that shop. (I think it use to be in a different strip mall.) I drove past it multiple times before finding it. I still have my little patterns and kits I bought from them, and I laugh every time I remember how desperate I was to find a stitching project! Your projects are darling! Perfect mementos. I'm setting up the Quilt show at the Heritage festival today. Do you remember Alma, this was the festival you came to on your first visit to Brigham City. I remember it well, because I was in California that weekend, and was very sad that I missed you. Just luv, luv, luv the t-cups. Does the store ship? I'm also crazy about your patterns/books. Will try the brownie recipe and bake in heart shaped baking bowls. Can't wait to see what you do with the yo yos. Terry in So California. What a wonderful beach vacation you are having! I love your commemorative samplers! 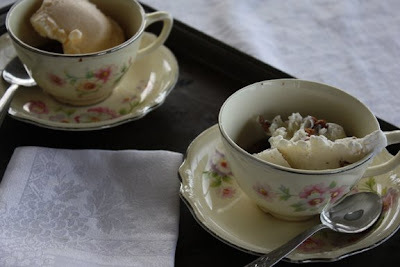 The teacups are beautiful, especially with brownies and ice cream! What a fabulous quick dessert! It sounds like you guys have been having a wonderful time. I don't know what's more mouthwatering, pictures of your stitching or hot brownies and ice cream in a teacup...haha! I asked my MIL who is 100 and was born and brought up in the pottery area of Staffordshire about putting the cups into a hot oven and she laughed. 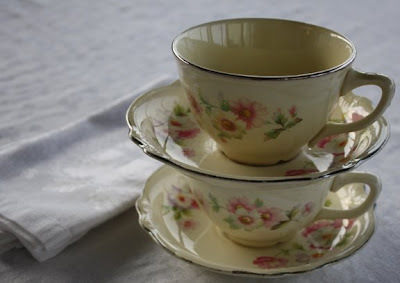 Bone china is baked at an incredibly high temperatures - over 2000 degrees F but it must be bone china. You girls are having too much fun! What a great way to get a new book complete. Can't wait to get my hands on that pattern. 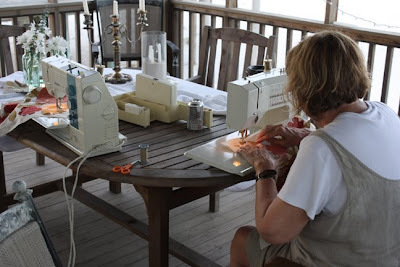 Love the outdoor sewing room....hmmm I think I need to add a screened in porch. I'm recovering from surgery on my hand so I can't do any stitching for a while, but I can still bake! I'll try these tomorrow. Thank you so much for the recipe. Oh my everything looks heavenly...thanks for the brownie delight. i wish i was there!!... the sewing machines all set up outside on the wooden table... i feel like i can smell the beach! 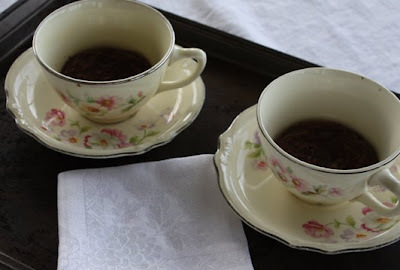 Oh, those little teacups are so cute and what a great idea for a sweet little treat. Of course, I think mine would be filled to the brim with ice cream. So glad you girls are having a productive time, cant wait to see the finished projects. Can I come play in your sweat shop? you two know how to make work FUN! hope to see you both at Primitives next week! 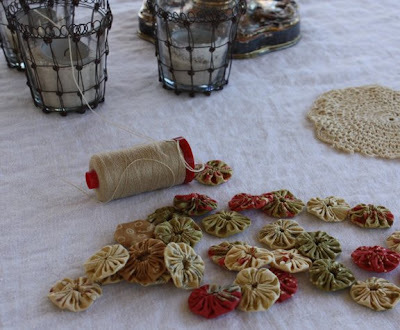 I just discovered you had a blog by way of Homespun Hearth's blog roll! My home state. I'm from Tuscaloosa but spent a lot of time in Mobile and Gulf Shores. I remember when it was almost deserted: tourists had not discovered it yet. Love Ft.Morgan and love crossing by the ferry. Lucky you two! Wow... thank you so much! I'll e-mail you with my mailing address. Congratulations on this great job and give us the opportunity to 'glean' smart! Blackbird Designs is 18 years old this year. Barb Adams and Alma Allen began this company in 1999 to share our love of color, pattern and fiber. Our books and patterns are available at your local quilt and cross stitch shops. Blackbird Designs also has a line of fabric with Moda. Our fabric may be found at your local quilt shop. Join us here on our blog for our latest bird-brained ideas.